It is difficult to imagine the development of modern forum without moderators whole state. In this article we describe in detail about the work of a moderator. Moderator - a kind of overseer. Person, who keeps order in the forum. He has the ability and the authority to edit or delete users' messages, issue warnings, block users, and to take other measures against violators of rules of the forum. Not to be confused with the moderator Administrator. The latter is much more authority. The main task of the moderator - to monitor communication on the site and to avoid the appearance of messages and topics, that contradict the rules of the forum. Besides, moderator before seeks to increase the popularity of the resource, stimulate the emergence of new interesting topics. 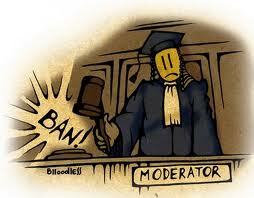 Moderator is also the resolution of conflicts between offline users. As punishment moderator may give a warning to users. Particularly zealous violators may block. The locking period can vary from a few minutes to infinity. It offers moderators usually address the owners of forums and thematic sites (for comments, too, need to follow). And, more serious forum, the higher the requirements to the moderator. for example, Forum nightclub small town approach moderator, which will be a couple of times a day to look at the site and remove the "bad" message. in front of, to "care" for the forum a wider scale (eg, Forum about sports and similar popular topics) a moderator, who will work full time, and which will have a range of specific skills and knowledge. Find job moderator can be on exchanges of freelancing (weblancer.net, freelancer.net). Often the position of a moderator can be offered to the most knowledgeable and active forum users. As for earnings moderator, it starts from 50-100 dollars a month (small forum, work a few hours a day). The more serious forum, than reputable companies, the higher salary moderators.